Hey y’all, welcome to March, where the theme this month is What’s on Top? – a direct contrast to last month’s theme of What’s Underneath. 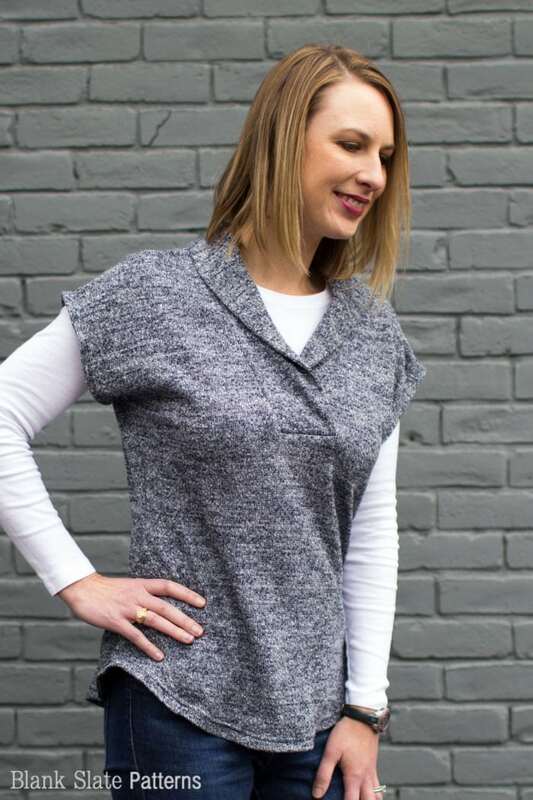 And today I want to talk about working with sweater knit fabric, since it’s one of the suggested fabrics for one of my newest patterns, the Sora Sweater. 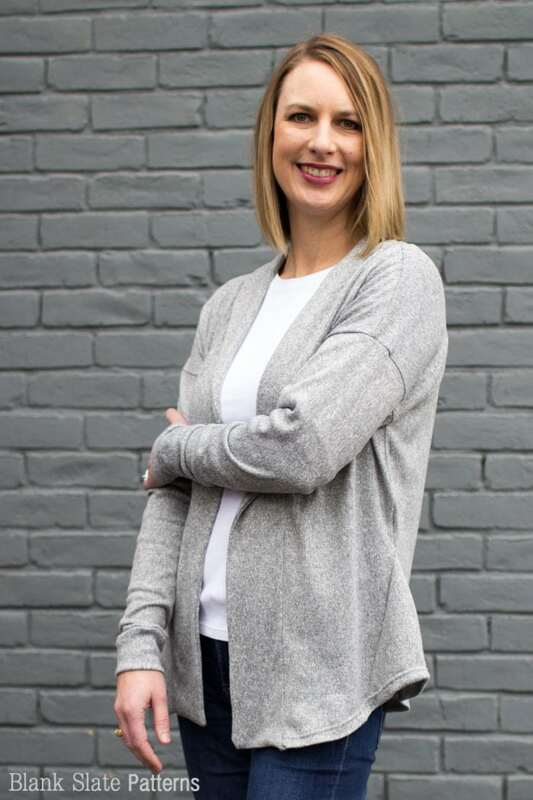 The Sora Sweater samples that I sewed for the listing (modeled by Courtney of Sweeter Than Cupcakes Blog) were both sewn in sweater knits. Also sometimes called Hacci or Hatchi sweater knits, these fabrics are the closest you can get to a hand knit sweater without actually knitting it. The sample fabrics I used were a navy blue heather warehouse purchase (similar here, affiliate link) and the gray was a purchase from Raspberry Creek Fabrics. 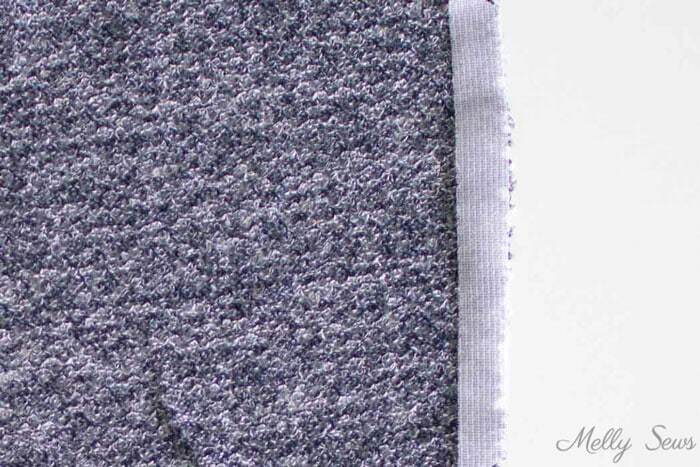 But as lovely as sweater knit can be in finished products, it can also be one of the harder knit fabrics to work with. So today I’ve got tips on working with sweater knit to get a beautiful finished result. First, unlike most knits, some sweater knits are prone to unraveling due to the looser knitted fabric structure. 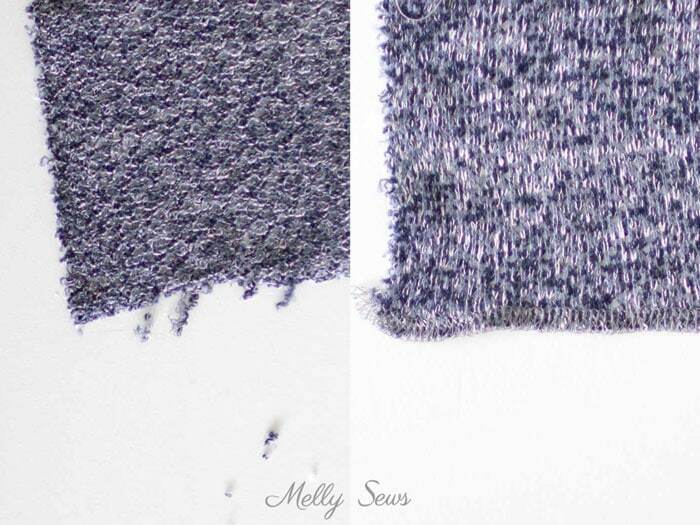 If that is happening to your sweater knit, it’s a good idea to finish edges with a serger or a faux overlock stitch. The same looser knitted structure means that sweater knits generally have beautiful drape, but it also means that the fabric can have a tendency to grow. To help support the fabric and prevent this, I like to cut knit interfacing strips about 1/4 inch wider than the seam allowances for a pattern and fuse those strips along the edges of my pattern pieces. This gives the seams a little light structure and helps keep the finished garment from growing longer as you wear it. 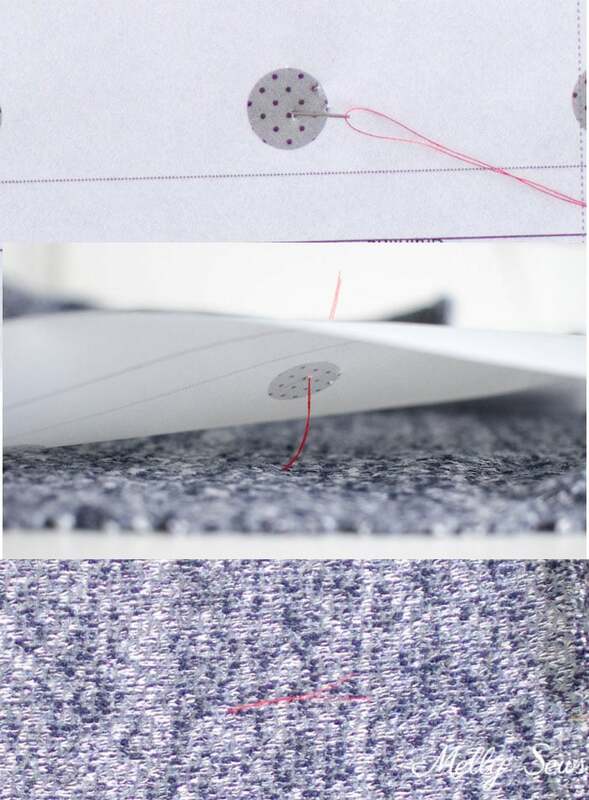 Marking can be a problem on sweater knits – typical marking tools like chalk and tracing paper don’t work well on the thicker, loosely knitted yarns. So thread marking is a good tool to have in your arsenal. To thread mark, you’ll take at least one stitch (from front to back and back up to the front side) through whatever you’re trying to mark – pattern and fabric. Use a contrasting thread and hand sewing needle. Then cut the thread and carefully pull the pattern off. The thread remains, marking the point on the fabric. 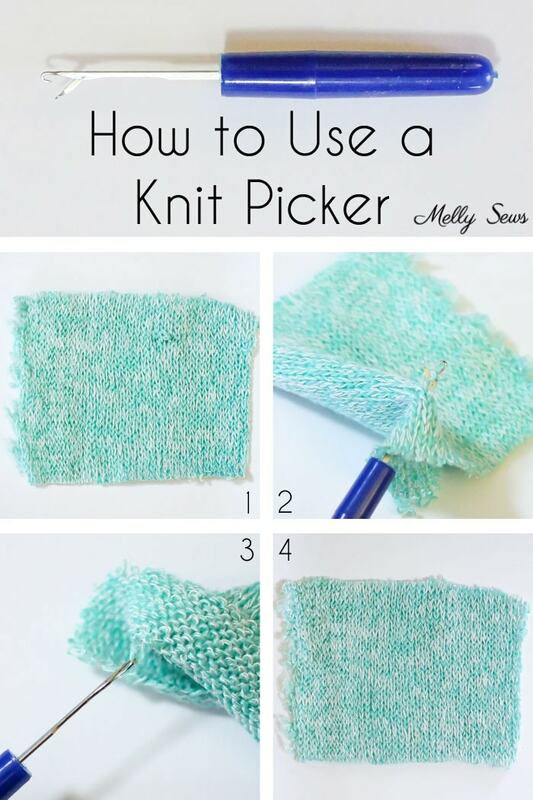 A knit picker (affiliate link) is a tool to repair your sweater knit if it snags, which can happen during the sewing process or after while wearing the garment. It’s essentially a smaller version of a latch hook. To use it, you push the knit picket in from the wrong side of the fabric with the hook open and catch the pulled thread in the hook. Then pull the snag to the wrong side of the fabric and watch it disappear. Finally, sweater knits often have nylon as part of the fiber content. So pressing with a pressing cloth is essential so that you don’t melt the nylon and ruin your project. 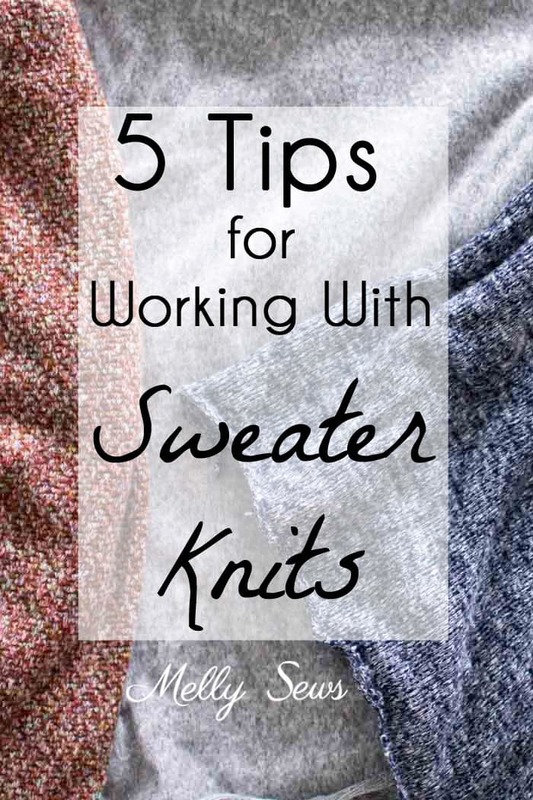 There you have it – 5 tips for sewing with sweater knits! This is helpful! Thank you. I’ve been wanting to explore the wonders of sewing with sweater knits 🙂 Do you have more suggestions for where to buy? I’ve tried JoAnns but the quality is generally so poor it’s not worth my valuable time. Online is difficult to judge quality – I’d love some recommendations! Thanks so much for this post! Sincerely Rylee Fabrics on Facebook is where I get all mine. Happy shopping! This is so helpful. 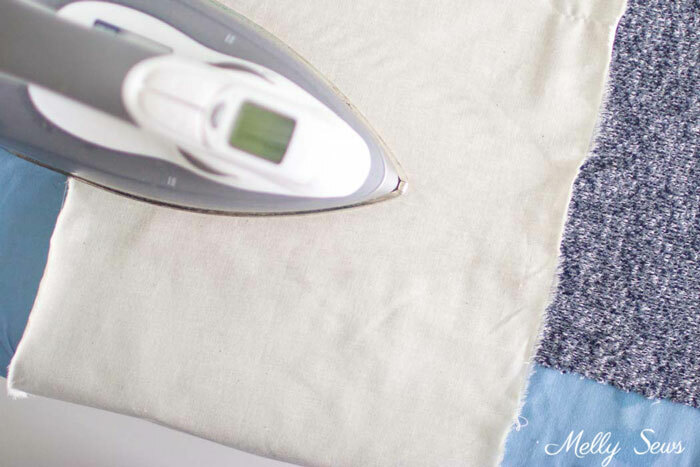 What kind of interfacing do you use? Frankly, I’ve always used one of the very small crochet hooks for the same purpose as the knitpicker, I did try one but it busted and snagged where I didn’t want any more. I’ve also used hooks to catch up ladders in knits and work them back in. I bought some hatchi knits thinking they’re some of the prettiest fabrics I’ve seen in a while. Your tips couldn’t have come at a better time. Thanks for this. Contemplating warmer clothing as it’s Autumn (Fall) here and there will be a need for more Winter clothing.